Yahoo and Google already offer web based version of their messenger service that do not require any download and install of messenger software. 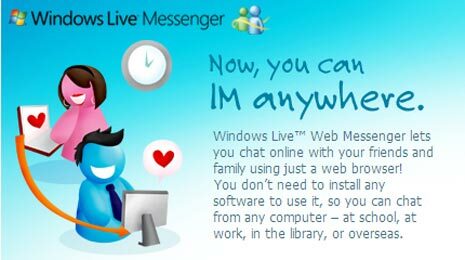 Now Windows Live users can also chat with their friends using official online Windows Live Messenger. This web based version does not require any messenger software download & install. 1. Goto http://webim.live.sg/ website (bookmark for future use). 2. Click Sign inbutton & login using Live ID. 3. Your contacts will load and you can start chatting with any contact of choice. 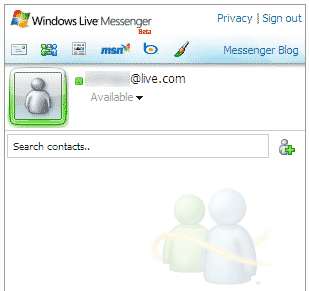 This is ideal for quick chat with Live messenger friends while using 3rd party computer. Being web based, it is just like logging into email inbox with functionality of able to chat with Windows Live messenger friends, like it? type into google download messenger! thats kind really it! then follow the instructions…..